It’s pretty amazing how much Disney movies can change the way you look at the world. I am personally part of the Aladdin Generation, so when I saw a physics paper discussing the mechanics of a flying carpet, I held my breath. Since no prototypes were built, there won’t be any romantic tours of the Taj Mahal any time soon (other than in my mind), but understanding the basic mechanics might be the first step. Although highly impractical for land use or carrying people, the paper did show that a flying carpet isn’t total fantasy. I had never noticed before, but sting rays that move along the ocean floor look a lot like how you might expect a flying carpet to move. To see what I mean, watch the video below. The rays have the added advantage of swimming, which we'll assume a carpet would not. But in their most relaxed state, you'll notice that the rays don't move very high above the ground. The potential to have a carpet hover relies on it moving closely along a flat surface. Thus we must add the first major constraint to our flying carpet: (1) no balconies. There’s a common example to show why they need to be close to the floor. Think about some time you dropped a very smooth piece of paper. If you’re a professional klutz like me, you might have noticed that as the paper falls initially, it just flops downward. But as it nears the floor it may suddenly slide some horizontal distance just above the floor. The presence of a rigid wall is essential to the movement. But such smooth motion only works for thin sheets of film or foil that remain flat, not lumpy humans. So, we have major constraint number (2): a flying carpet would have to be nearly rigid to support the weight of two people. Major constraint number (3): The size of the waves (mostly their length) made by the sides of the carpet (like the sting-ray) determine the velocity of the carpet, and the velocity is related to the size of the potential carpet. In order to get a carpet with any real speed created purely by its stingray-like wave motion, it would have to be very, very large and have a pretty impressive motor. The rays also bring to our attention constraint number (5): A more viscous fluid is desirable for magic carpet use. Air is very not viscous compared to water. Think about how easily you can make yourself levitate in a swimming pool, and how difficult (or impossible?) that would be in air. So, magic carpets are not so good in air, probably better in water. 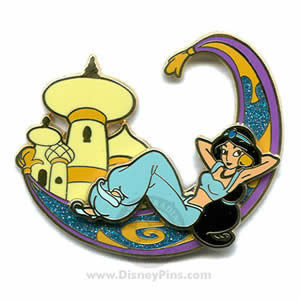 Ariel is more likely to get a magic carpet ride than Jasmine. Assuming those people are real (and odd assumptions are often made in theoretical physics). So what are we left with? Considering the weight you’d be carrying, in this particularly non-dense fluid (air), in need of a HUGE piece of carpet to make HUGE waves, and an engine so big it probably wouldn’t make sense, magic carpets are very impractical, but theoretically not impossible. Internet Loves Physics. Who Knew? Preparations for APS March Meeting Underway!